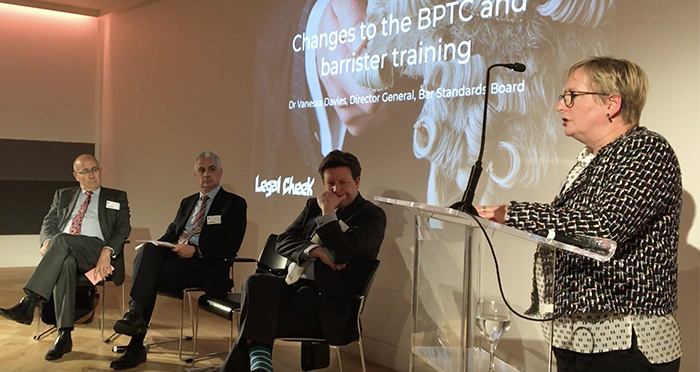 The bar regulator’s director general has told an audience at Legal Cheek‘s Future of Legal Education and Training Conference to expect “exciting new things” as it pushes ahead with its radical overhaul of barrister training. Dr Vanessa Davies said the Bar Standards Board (BSB) plans to submit a new regulatory framework to the Legal Services Board (LSB) for approval this autumn, and that the new rules may be given the stamp of approval by as early as January 2019. Barrister training, as many aspiring advocates will know, has many problems. James Wakefield, the director of the Council of the Inns of Court, summarised them well when he said the Bar Professional Training Course (BPTC) is “very high cost”, “very high risk” and “extremely inflexible”. These problems, it’s hoped, will be alleviated by allowing students to study for the vocational bar course in two parts. Part one of the assessment, which Wakefield called the “knowledge assessments”, can be taught online; part two, which will teach and test skills such as advocacy, is a shorter skills course than the current BPTC. Both these factors should keep costs down. Splitting out the cost splits out the financial risk, while Wakefield says the new pathway is more flexible than the BPTC, too, as “students should be allowed to study [for the first part] in any way they wish”. On the apprenticeship pathway, Davies said “the BSB would like to be able to approve apprenticeships for the bar, but we recognise that those are much less likely to develop quickly, and that’s largely to do with the structures and the business models prevalent, especially at the self-employed bar”. It seems the possibility of a split BPTC will be more immediate, though. Davies anticipates that, subject to LSB approval, the earliest point at which the new rules can come into effect will be January 2019. That said, it could be two years after that that students start these new courses, this because of how long it takes to get new university programmes devised and approved and because of rules about how far in advance courses have to be advertised. Greater flexibility in pupillage is also on the BSB’s agenda. PJ Kirby QC, the joint head of Hardwicke, sympathised that pupillage can be a “pretty nerve-wracking 12 months” reminiscent of a year-long job interview. Speaking at the Bar session of the Conference — which was sponsored by legal tech company Bar Squared and barristers’ chambers Hardwicke, and featured sessions on innovation, the solicitor super-exam and more — Kirby said “we’ve got to try to do things that make the pupils feel more a part of chambers”. For example, he encourages chambers to have their pupils move around during their year-long traineeship. Pupils “need to be seen and heard and be very much part of chambers life”, he said. Chambers’ role in nurturing future barrister talent doesn’t just begin on day one of pupillage, said Steven Barrett, the chair of Big Voice London and a barrister at Radcliffe Chambers. Sceptical of “top-down changes”, Barrett asked the barristers in the audience to “think up ways of engaging” young, disadvantaged students, stressing that the thing that often puts people off the bar is not knowing enough about it. Barrett’s plea has social mobility at its heart, as does the BSB’s legal education plans, said Davies. She said the reforms are based on four core principles, one being accessibility. She said it’s “vital” the profession is open to the widest possible range of students. Tied to this is affordability, the next key principle, Davies stressing she wants to see value for money of barrister training enhanced. Flexibility is the third key principle, and sustaining high standards is the fourth. My many, many, many admirers and cosplayers are at work again. I know you all love me but please stop the imitations. If accessibility is an objective, is not the solution to simply limit the BPTC (or perhaps the practical side of it?) to those who have already been offered pupillage? Then, a far higher proportion of students (if not all) would have their course funded either by Inns scholarships or draw-downs from their pupillage awards. Is there any cogent argument against that solution? Because it never seems to be seriously discussed by the regulator. International students. Not a great argument but that’s it as far as I can tell. I suppose there could arguably be indirect effects that disadvantage those from a lower socioeconomic background, as they are less likely to have the connections that might enable a successful, early application. But that is more a criticism of pupillage than the BPTC. The LSB has already ruled that such a move would be unlawful in terms of restricting opportunity and access to the profession. Those whose education had been more challenging for many diverse reasons need the chance to take the programme and have the right to compete for places in pupillage. Also, practically, if you restricted the numbers to those with pupillage, there would be insufficient volume for any provider to actually run a programme out of London. That has massive diversity and opportunity issues connected to it too. The Inns 2-stage approach will cheapen the process, which will actually attract more people to go through the funnel rather than less. Beware the law of unintended consequences…..
Dr Vanessa Davies is a non-practising barrister? What does that mean? She did the BVC in 2005. Why didn’t she practise? Is it the case that the Director General of the BSB failed to secure pupillage? Regardless of whether she failed to secure pupillage, the director general of the bsb certainly didn’t complete one. How odd! Why does it matter if she did pupillage or not? I couldnt get a pupillage but at least I know deep down im a really great advocate and all the barristers in chambers are silly bum bums who cant do decent advocacy to save their lives and they all vote for nasty right wing parties like the BNP and Conservatives or Trump and they would vote for kim Jong un if they lived in NK and you were allowed to vote. Well….at least it reduces the plagiarism and cheating.